KSP has been in development for a while now. I first played it this time last year, when it was a free alpha and had a grand total of two rocket engines, two couplers and one capsule. Even then its potential was clear, because even though that version was the most basic bare-bones version of the concept, the concept just happens to be making a pseudo-accurate simulation of building and launching your own space rockets. It’s fantastic. No, really. These days you have to pay $15 for the latest alpha version (although the old one is still free). You totally should, though; a year of development has added two moons you can land on, an improved UI that indicates atmospheric pressure and your projected orbital — or escape – trajectory, and a whole host of new rocket parts including RCS thrusters, jet and ramjet engines, wings, control surfaces, landing struts, fuel lines… it’s a very long list and the game isn’t even close to being finished yet, with a slowly-expanding BARIS-style space centre that remains mostly non-functional at the moment while the developers nail down the sandbox element of the game. In Kerbal Space Program you are the omnipotent designer, builder, launcher and pilot of the Kerbal race’s Heath Robinson-esque attempts to escape the gravity well of their home planet, Kerbin. 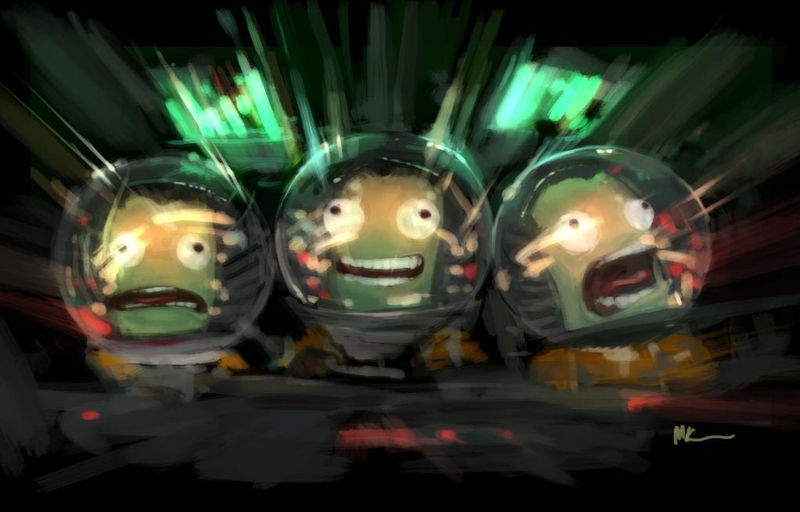 You start your spaceship design with a command capsule containing three suicidal Kerbal astronauts. As your first rocket you might decide to keep things simple by adding just a fuel tank and an engine of some kind underneath the capsule; the builder is fairly intuitive with the modular rocket parts automatically snapping to pre-determined connection points, so this wouldn’t take more than thirty seconds or so. Then you rush it out to the launch pad to see what happens. There’s a lot of ways you can fail in KSP, and seeing just what kind of unanticipated disaster will befall your spacecraft next is half of KSP’s fun, especially when the failures are so spectacular. It can honestly take a bit of work just get a spacecraft design off the launchpad when they have a penchant for falling to bits if not structured correctly. Rocket engines that run on liquid fuel need some way for the fuel to get to them, either directly or through a fuel crossfeed. Somebody new to the game might be tempted to attach some solid fuel rocket boosters onto their spaceship, but while these have the great virtue of being simple they also have the slight drawback of essentially being an unstable lump of explosive material stuck to the side of your rocket. Even if you manage to get it off the ground you have a hell of a task ahead of you just controlling your heading, orientation and fuel burns to get into orbit. KSP is a game where succeeding in your chosen goal for the first time – suborbital, orbital, moon landing, whatever — does not come easily. However, behind the succession of comedy failures lurks a surprisingly deep iterative learning process which mimics the way real space programs are developed. 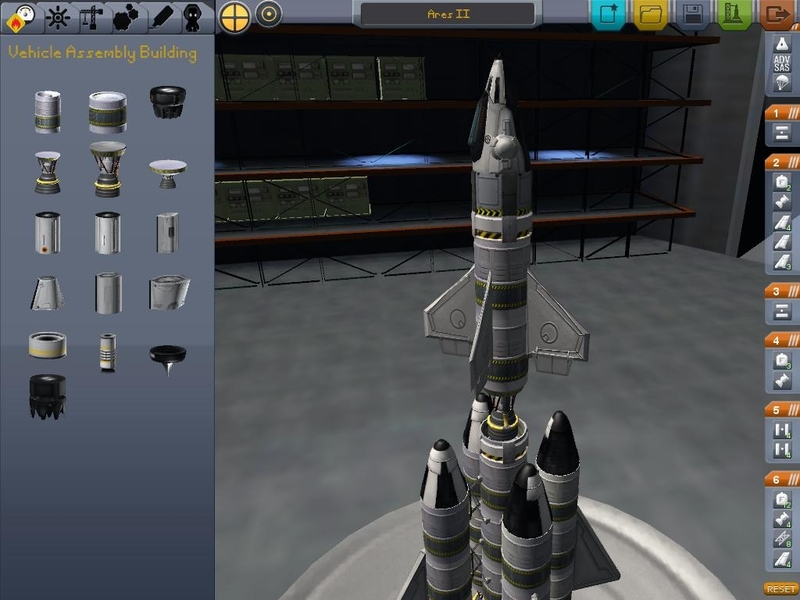 KSP is a game that – for now, at least – fosters experimentation. At the moment it consists of a basic sandbox mode where all rocket parts are free and you can have as many as you want on your spaceship, while pile-driving your three astronauts into the bottom of a burning crater carries no penalties besides having to take that particular rocket design back to the drawing board. You are free to try as many launches as you want in order to make it work. And slowly, gradually, you’ll start to figure out what you should and shouldn’t be doing. 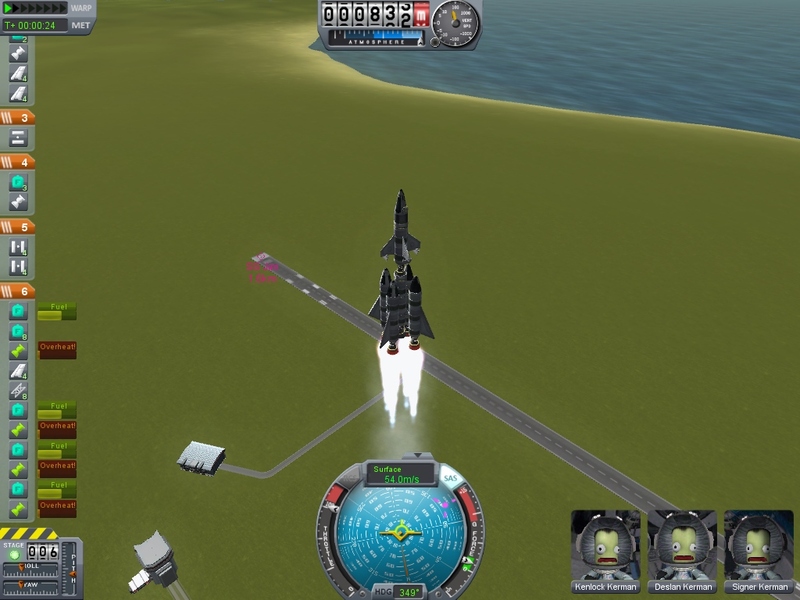 It becomes apparent that more engines do not necessarily equate to more thrust when your burn all six of them at once and your rocket only gets about a foot off the launch pad, and that experimenting with explosive decouplers that separate a rocket into discrete stages is far more efficient. How many stages do you want, though? How many boosters per stage? Do you really need that tri-coupler there? Fine-tuning this, as well as the fuel/payload ratio, is what occupies you during the first couple of dozen launches. Eventually, though, you’re going to refine your design to the point where it’s capable of escaping Kerbin’s gravity well, and it’s at this point that you encounter a whole new challenge: getting into orbit. This is not as simple as you might think. Orbit is often described as “falling without hitting the ground” and hey, falling’s pretty easy, right? It’s just a matter of giving yourself enough sideways velocity so that you fall towards the planet you’re trying to orbit at the same rate as the ground falls away from you due to its curved surface. Surely, then, orbit must be a matter of going up high enough and then turning your spacecraft ninety degrees to the side and making a full burn of all remaining engines. 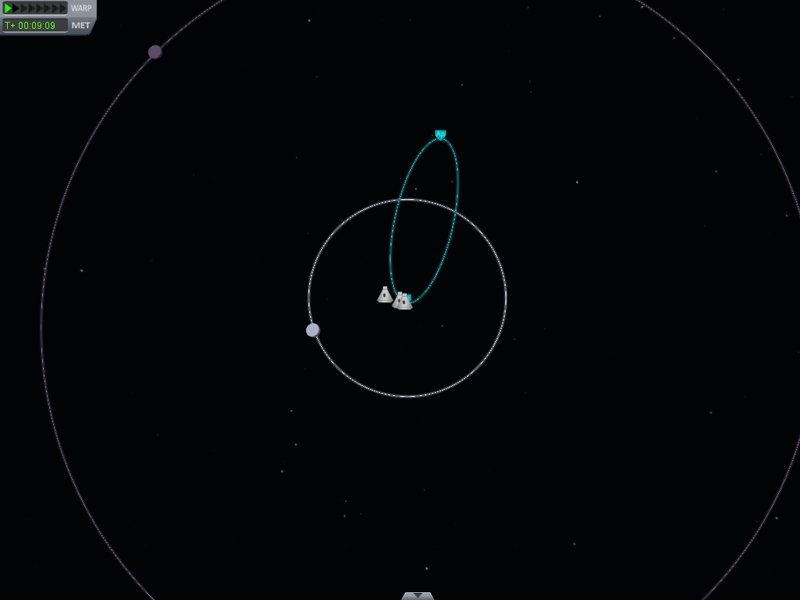 A highly, highly elliptical orbit with the periapsis about 100km above the surface of Kerbin and the apoapsis out beyond the orbit of the sodding moon. It took over a day to complete one orbit. My problem was I went up to a height I thought would be sufficient to fall from without hitting the ground and then made my sideways burn, but I forgot that a spaceship isn’t a car and that it still had a vertical velocity of over 2km s-1. The sideways burn didn’t help either because it was still pointed slightly up, hence the ridiculous orbital altitude. Clearly I have some way to go before I can even think about attempting a moon landing. Here, again, I have some inkling that it’ll be far trickier than I think because if you point a spaceship directly at the moon and blast away for 48 hours then by the time you get there the moon will have moved on in its own orbit and you’ll have missed. A successful moon landing requires you to get yourself into an orbit that crosses the moon’s orbital path, and then for the two orbiting bodies – spacecraft and moon – to occupy the same area of space at roughly the same time. The patched conics system that makes up KSP’s map makes this a little kinder on the prospective lunar explorer (although it has been done without by a crazy person, which incidentally demonstrates how much easier it is to get out of a moon’s gravity well compared to a planet’s gravity well) but it’s still a challenge that is going to result in lots of failures, and hence lots of hapless Kerbal astronauts floating helplessly around the solar system inside their steel coffins. KSP is something that everyone should try, I think. That alpha I played last year is still free, after all, and you’ll get some idea of what it’s like to try to launch a rocket into orbit. The full (well, fullest) version adds spaceplanes to the mix, giving you a whole new type of craft to ram into the ground at 5000 km h-1, and the next release seems to be adding in EVAs for the little Kerbals giving them a physical presence in the game beyond the three perpetually-terrified portraits in the lower right-hand corner of the screen. It says something about Kerbal Space Program that I’m currently trying to figure out some way to tie it into genuine science education; it’d be excellent for demonstrating why staged rockets are superior, along with a lot of other basic concepts of rocketry. It’s nowhere near a 100% accurate simulation, but then I don’t think I’d want it to be. KSP successfully walks the fine line between player enjoyment and technical verisimilitude without ever falling off of it, and that, I think, is its greatest accomplishment. Kerbal Space Program makes rockets fun. Just began my KSP experiance last week. Fascinating game ! It is, isn’t it? I still haven’t managed to land on the moon without killing all my astronauts. God knows how Apollo managed it. Will you revisit this game anytime soon? The additions made to this game and the community-made addons make this game more time-worthy than many other games out there. At least, in my opinion.